November 6, 2008: Thimphu was filled to the neck, so we decided to enjoy ourselves in the school. We had our school picnic to make the day memorable. The ceremony in Thimphu was telecast live on BBS. I quickly Googled a way to project the TV on wall and made it possible before they could boil the morning tea. Now, school hall gathered huge crowd. I was proudly waiting for the crowning ceremony; didn't have a clue how it would happen- father king crowning his son. Never saw one before- none would have possibly seen in the entire history of mankind. I was shivering with excitement. Picture of fifth king with crown was already publicized but still the thrill of seeing His Majesty wearing the raven crown on TV was killing me. 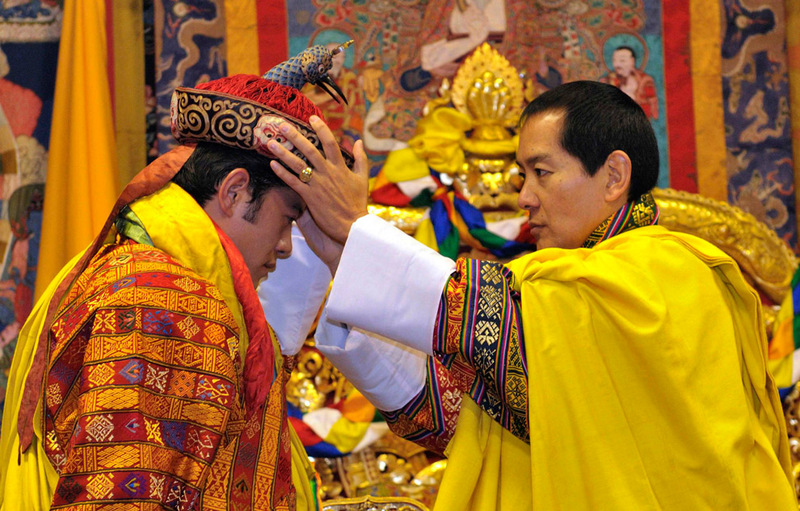 Everything seem to happen in slow motion- Je Khenpo lifted the crown (I thought it would be heavy but it wasn't) and offered to our fourth king. My eyes were gathering tears suddenly, I didn't know why. My heart raced and then it stopped all together when our new king bowed to his father and received the raven crown. The hall went dead silent and world stopped moving. Then came the loud cheering and clapping and shaking hands and hugging. World just witnessed the magic of the millennium. Today we celebrate the 2nd coronation day and I wish my king immortality and perfect happiness. His majesty is celebrating his coronation with the victims of Chamkhar Fire today. For the Record: November 1st is observed as the coronation because that was when the ceremony began from sacred chamber (Marchen) of Punakha Dzong.